I have the gorgeous candy brandywine red 2004 Big Dog Mastiff custom motorcycle for sale that has Vance & Hines serpentine exhaust pipes, a MUST SEE custom paint job and currently only 8,000 miles on it. If you're interested you can make an offer, ask questions or to request more pictures of the customized 2004 Big Dog motorcycle for sale using the comments form found directly below this classified. Strike Lightning Motorcycles for Sale also invites anybody who may be having any problems with their 2004 Mastiff to leave their questions or describe the exact problem that you're having and your contact information in the space below and see if somebody who stops by may offer a solution for how to fix your bike. We also encourage bikers to submit their opinions and reviews of the 2004 Big Dog Mastiff for sale to help potential buyers make informed decisions and to benefit the biker community as a whole. 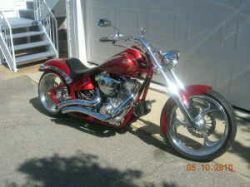 the custom motorcycle for sale is located in Rhode Island New York in the asking price is a very reasonable $22,000.00. Where did you get the exhaust pipes ? I Have the same type of bike & would like to know the part number for the exhaust pipes as I can't find them in Vance & Hines parts lists.